Long after the last footsteps could be heard pattering down the hall or the sound of water in the pipes, I finally threw back the covers and hopped out of bed. I knew exactly what I wanted to wear, and it only took two seconds to pull it out of my suitcase. I then slipped into the bathroom and got dressed. As soon as I was done, I crept out of the bedroom and down the hall. I could hear my dad snoring in the guest bedroom, while the sound of muted TV came from the office where Eli and Gabe were sleeping on an air mattress and the pullout couch. Grabbing a flashlight out of the hall closet, I then snuck out the front door. I jogged as fast as I could in my robe and slippers across the front lawn and down the hill. Thankfully, Angel had actually listened to me when I told her to stay on the porch. The last thing I needed was for her to start a barking marathon and alert everyone that I was running around half-naked outside. When I got to the barn, I reached under one of the potted plants to get out the hide-a-key. Gently, I unlocked the door and stepped inside. When I closed the door behind me, I heard rustling in the bed upstairs. Without hesitation, I made my way across the living room toward the stairs. Of course, I didn’t expect Jake to have left his shoes in the middle of the floor, causing me to trip and bang into the ladder. “Ow!” I cried before I could bite down on my lip. “Abby?” Jake questioned. Within a few seconds, he was peering over the railing of the loft. “Do you remember this?” I asked, running my hand over the silky material. “Oh, hell yeah,” he said, as he backed us over to the bed. Jake is more settled now and totally comfortable to have Abby and to be getting married. Although he’s still nervous about starting a family, it seems his bandmates are doing nothing but having kids, and Abby is totally broody! And in true Jake fashion his insecurities manifest………he very nearly ruins their honeymoon. 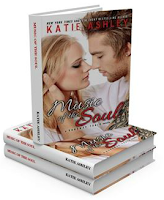 They get home and settle into their new life , the band is getting huge, they are busy touring and songs are coming to Jake thick and fast until an event that turns his and Abby’s world upside down. “Without a thought, I raced to her side. “Is she….” My voice choked off. I couldn’t even form the words I feared so much. As usual Jake takes it out on the ones he loves…..AJ and Mia! Will Abby ever recover from a future snatched from her? Will Jake get over his guilt and make his marriage work? Take a look and complete Jake and Abby’s story! I defy you not to laugh and cry!